Two years of research. Three new technologies. For years audiophiles have been asking for an amplifier rivaling the Cinénova Grande in audio excellence, but positioned in the 200 watt class. 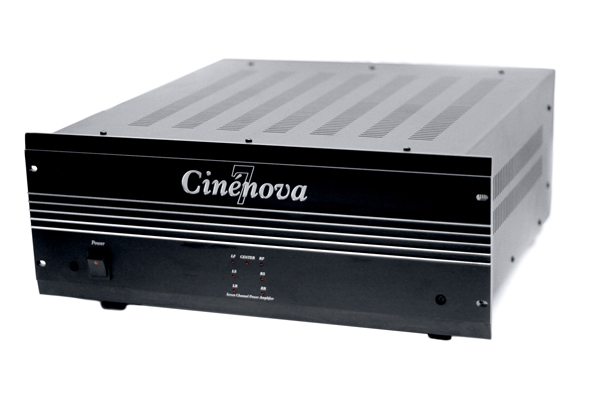 The Cinénova name represents the pinnacle of amplification regardless of price. Traditionally, listeners assume that a reduction in power and cost will influence the quality of sound. With a constant demand for this amplifier. Earthquake’s chief engineer Joseph Sahyoun descended into the Earthquake research laboratories determined to crack the code to the universe and design an amplifier with no compromise in sound quality and competitively priced. Since its inception the Cinénova design concept has been a tempered blend of traditional high-end virtues combined with innovative and novel circuitry design. Produced using in-house proprietary manufacturing techniques this tradition lives on in the new Cinénova 7 with a completely monaural design and enhanced class AB operation. The result is industry leading efficiency making the Cinénova 7 a true green amplifier. 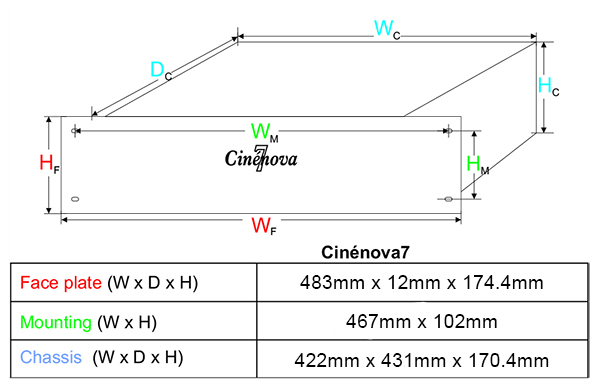 Several new technologies had to be created during the intense development process in order to miniaturize the Cinénova Grande reference design. Contrary to logical thinking you cannot scale down an amplifier and expect it to perform the same just at a lower power level. Since real world customers don't play gentle on small, easy driven loudspeakers, high performance amplifiers have to be built and tested to the most rigorous standards. When lesser amplifiers are tested on low impedance, highly reactive speakers, they quickly lose control of the speaker cone. This results in muddy and distorted sound. Earthquake engineers put prototype after prototype through rigorous and exhaustive testing. The conclusion was that even at 200 watts the industry standard of 2 to 4 output transistors per channel simply was not sufficient to retain the taunt, punchy and distinctive woofer control that the Cinénova name has become synonymous with. The Cinénova 7 employs 8 massive output transistors per channel ensuring that even the most demanding speakers are held in an iron grip and any soundtrack is reproduced with dynamic precision and articulation. During the research process for the Cinénova 7, three core technologies were developed to optimize the amplifier and elevate its performance above its class. The MARS technology (Magnetically Actuated Reanimation System) is a new type of protection system that enables the use of all the amplifier’s power resources without compromising the survivability of the amplifier under catastrophic conditions. Typical protection systems rely on fuses or relays that complicate the signal path thus degrading audio quality. MARS is different as it is not in the signal path, but works by sensing the electro-magnetic signature of the speaker output wire then translating this input into amperes flowing through the wire. Using the principle discovered by Danish Scientist H.C. Oersted, this design has no impact on the sound quality of the amplifier as it is totally separate from the audio circuits. The internal communication of MARS is handled via optics rather than electrical circuits. This means MARS does not create an electromagnetic field as no current is flowing through wires. The signal path remains free of artifacts that impact and taint the sound in other designs as no amount of light activity can influence an electrical system. Normally a relatively large safety margin is necessary because of the antiquated nature of traditional protection systems. MARS operates at 500khz speed making it deadly accurate. This enables the amplifier to utilize the outputs SOA (safe operating area) to the limit. This gives a MARS enabled amplifier 20 percent more power than an identical non-MARS amplifier. During testing the MARS technology showed that the output of the amplifier could be short-circuited at full power more than a thousand times with no damage to the amplifier. MARS does not use any relays or other damping-factor reducing mechanical switches that can wear out or fail over time. Instead, a specially designed circuit instantly shuts off the output drive. The ION technology (In-Circuit Optimization Network) is an advanced network of connection points on the Cinénova 7 circuit-boards. Traditionally, transistors and capacitors are paired, grouped and tested to ensure compatibility. However, it has been shown especially by exotic and esoteric audiophiles across the globe that even highly refined mass produced amplifiers have substantial room for improvement when individually tweaked and optimized. A lot happens when individual components are put together in a circuit. A certain margin of difference between two seemingly identical circuits exists. Some engineers refer to this as the “Ghost in the machine.” The option of being able to fine-tune and optimize a circuit even after it has been built would be the evolutionary solution - enter the ION technology. ION enables individual tweaking while remaining in a mass production environment. When the circuit is completed, the ION network is connected to a specially designed diagnostics computer that automatically determines the optimal connections and ION then makes those connections permanent. The ConCurrent power supply design ensures full power can be delivered at all times to all channels simultaneously. Earthquake engineers developed the parallel symmetric transformer with identical electromagnetic coupling for each secondary winding. Every channel has its own secondary winding, capacitor bank, rectifiers and output circuitry all mounted on massive, individually, vertically-ripped extruded aluminum heat-sinks. The individual channels remain sovereign and autonomous as sharing is not required. This guarantees that no matter how hard one channel is driven it will have no effect on surrounding channels. Power supply efficiency, stiffness and strength are dependent on several factors. The ConCurrent design is the culmination of intense optimization of all known parameters. To stiffen the supply (lower regulation factor) the transformer cores are made of ferrite instead of a lower grade iron material. The windings are made with the same oxygen free copper that is used in high-end speaker cables. To ensure hum-free operation, the transformer is hard-wound and made with military grade high temperature lacquer. The ConCurrent power supply in the Cinénova 7 has a combined transformer rating of 2400VA. A high-end design using completely separate output blocks are largely unheard of in this class of amplifier, but with Earthquake’s enduring strive for quality and excellence there simply was no other way. From the loudest crescendo to the finest syllable, the Cinénova will remain composed and in control. We invite you to enjoy the unique ownership experience of this Cinénova amplifier that was designed by a brilliant mind and built with loving hands. Front panel instrumentation: One amber LED pr channel flickers when dynamic headroom is less than one db for the corresponding channel. If it lights up continuously the channel is at maximum output and volume should be reduced.